The Optical Imaging Chamber enables the maintenance and isolation of rodents under inhalant anesthesia during bioluminescent or fluorescent Optical Imaging studies. The 11cm X 18cm viewing aperture is made from an optically clear, scratch and smudge resistant, anti-reflective, specially formulated cell cast acrylic. Performance of the aperture across the wavelengths of light used in optical imaging studies is as good as, or in most cases, better than glass. Performance data for the aperture is available upon request. 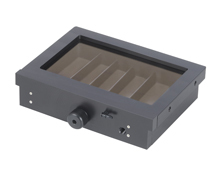 Unlike other chamber designs which require mouse positioning to be done quickly and in a fume hood, animal positioning in VetEquip's Optical Imaging Chamber is made easy by the use of a specially designed slide out tray with attached five mouse anesthesia delivery manifold. The coaxial nosecones integrated into the manifold safely maintain a constant delivery of anesthesia to the animals while actively scavenging the anesthetic gases away from the investigator during the animal preparation phase. Once the animals are in position, the tray is simply inserted into the chamber and the chamber assembly can be moved to the imaging system and connected to the anesthesia and vacuum connections there. The 15cm deep x 22cm wide x 15cm tall Imaging Chamber assembly is made from non-fluorescing materials that are easily cold sterilized. Included with each chamber is a set of four dividers that can be used when imaging multiple animals in the chamber, plugs for sealing off any unused anesthetic outlets, tubing and fittings for connection to an anesthesia system and vacuum scavenging.